That's right, not only is that a Green Lantern episode, but it's a Green Lantern episode with Star Sapphire and Wonder Woman. Not only that, I'm almost positive that's Steve Trevor. I mean, look at him. Who else is that comfortable being carried around like this? 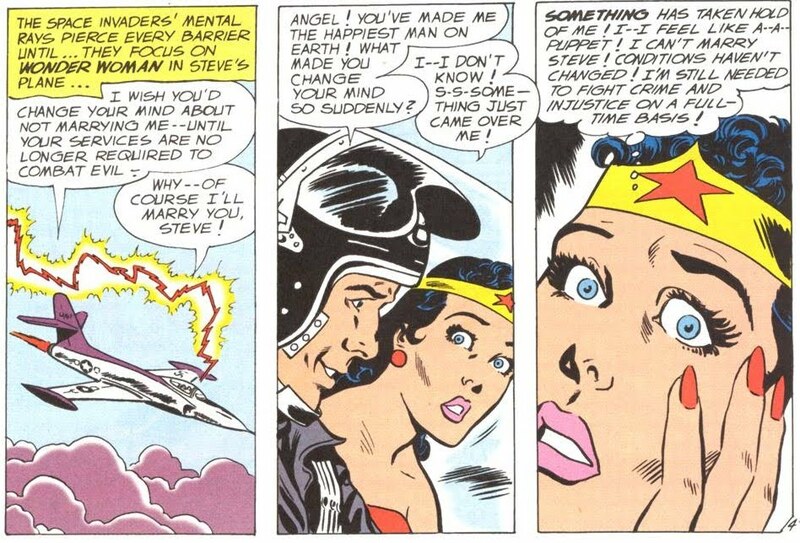 I think we can safely assume the Wonder Woman scenes are the cold open. If so, that's an incredibly good choice for a Star Sapphire episode. The Zamarons are the outer space all-female society that create a female warrior and force her to fight her boyfriend to convince her to leave him. It's a good thing to have the princess of the peaceful earth-based Amazons being heroic in the lead-in just for that. Also, I'm a sucker for the off chance they'll compare Steve and Hal. Those two characters have a lot in common on the surface. They're both military pilots. They're both adventurous men notable for their courage. They're both a bit slow on the uptake at times and prone to head injuries. And using the classic setup, they both love women that have some authority over them. In Hal's secret identity, his love interest Carol is his boss. 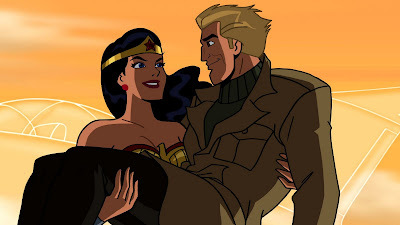 Steve Trevor is dating Wonder Woman, who naturally outpowers him in every way he can imagine But they deal with courting a woman of authority... differently. Here's Steve trying again for marriage in August, 1959. Here's Hal asking for a date in October, 1959. Granted, Steve has a standing Saturday night date with Wonder Woman and Carol has told Hal to call it quits for a while... but I think it's pretty clear right there why Steve has a standing date despite spending most of his time unconscious and Hal has to wear a mask and fight monsters to trick Carol into giving him a second chance. This is not a comics post. This is a current events post. As such, it requires a disclaimer. I do not speak for the US Air Force. I can not presume to speak for any other member of the armed forces except for myself. However, I've been in so long that it's impossible to speak from any other point of view than as a member. So take this as my personal experience, my personal speculation and not anyone else's opinion or the official line. Like every other American old enough to remember the day, I have a September 11th story. It's one of those things that only ever seems to come up in military conversation, so I've related it to few civilians. To be honest, I'm not really comfortable relating it to civilians. That's not because it's such an intense, emotional experience that only another military member can understand it. It's because the story is humorous. If that bothers you a lot because of your own experience, I won't be hurt if you stop reading now. I'd been in the Air Force a full year by that point and was at my first duty station. It was my first permanent assignment, but the primary mission of the base was training. Because my first career field had been an extremely poor choice I was working in the dorms while I waited on my retraining paperwork. The week prior the Command Chief for the Wing had made a surprise visit and been shown the worst three rooms in the dorm by the dorm manager. So Tuesday, September 11th, we were scheduled to have the Command Chief and ALL of the First Sergeants come to the dorm to inspect. I was making sure the common areas were neat when the second plane hit. There were three or four people watching television in the dayroom, transfixed by the sight. It didn't register as anything more than a very foolish pilot to me (and as the spectacularly poor career choice had been Air Traffic Control, this was easy to believe), and I couldn't do anything about it so I continued with my work. I had no idea how big this was until an ALS (Airman Leadership School, which was held on the first floor of this multipurpose building) student tapped me on the shoulder and told me the Pentagon had been hit. He took my ID (which he should not have done) and assigned me to guard the door to the dorms. For the rest of the day, the biggest worry on my mind was getting my ID back. I spent most of that day in front of that door, checking identification and observing the first true military crisis since the beginning of my career. It remains the most absurd experience of my life. People ran in and out to get things, my instructions changed at least five times, I helped enact baffling security measures, I painstakingly examined the orders of hungry foreign officers, and I witnessed what may be the most mind-boggling decision ever made in military history. The decision to inspect the dormitories, as scheduled, on Tuesday September 11th, 2001. We were all sure this was canceled. Anyone with a command position would surely be involved in important decisions. Everyone was running in the dorms to grab their equipment before rushing back to work and the bay orderlies were all occupied by security, so all the cleaning done over the weekend was ruined. I was iron-clad certain of one thing when I started to guard the door, and that was that I would not see the Chief that day. Then the First Sergeants started filing in. The First Sergeants from all the Squadrons that shared this dorm. One by one, they came. One by one, they cheerfully set their coffee cups down and showed me their IDs. Once by one they went past me into the common areas. I was incredulous. So were they, but they were expected to be there and no one had canceled. Even then I personally assumed the Chief had been so busy she didn't prioritize calling off the pointless nitpicking of our living quarters. It was the shock of my life when she showed up and asked what I'd do if someone didn't have any ID. The more important decisions had been made and now the highest ranking enlisted person on the base was smiling and ready to not only look at clean dorm rooms but grill unsuspecting door guards about security procedures. I tell that story whenever I think an Airman is making too many assumptions about leadership. I always get a mixture of disbelief and laughter. It really is one of the most amazing stories I have, but it feels weird to tell it. Most Americans have Sept. 11th stories that are deeply emotional. They describe horror, despair, unity, and hope. Our younger Airmen tell their stories like my mother's generation described JFK's death. Everyone remembers where they were, and everyone remembers feeling the same things. I and a lot of the people who had begun their career by that point have different types of stories. The unity was there before, it's always been there because that's part of being in the military. We have stories with sadness, fear and hope like our civilian counterparts but a lot more of us tell those stories with wry humor and pride. Military culture cultivates an emotional distance that a lot of civilian culture doesn't seem too. It surfaces in that famous gallows humor where you joke equally about the deaths of your enemies, your friends and yourself. It seems very cold and impersonal to the uninitiated. Many people may find it horrifying, but it's a necessity to the sort of work we do. Today, we had a mass briefing for the squadron. We're doing a big training exercise, it's not a real mission but it's something we've been preparing for a long time. We went in early, and before the briefing I heard someone asking if anyone had heard Osama Bin Laden was dead. One row down there was a Captain who cynically interjected "allegedly dead." I grinned at him. "He's been allegedly dead for years sir, we might as well take this one." This weak joke got a chuckle out of him. After the briefing, the Group Commander got up to give us a pre-exercise pep talk. As part of his icebreaker, he announced that Bin Laden was dead. We dutifully clapped and cheered. Then he went on with his business, and told us what he expected from us during this exercise. And we were on with our business, discussing this during breaks and while waiting in line like we discussed any piece of news. I know some of you think we're monsters, and no doubt I'll get a few people in my comments anxious to discuss American policy and the worthlessness of this one deed, and the wickedness of revenge, and what a terrible person I am for making a joke about the rumor. And I also know some of you are troop-boosters, ready to give me some words of encouragement and talk about closure, and relief, and maybe some sense of joy from it. Really, both sides make me cringe because I can see them both philosophically but I get the intense feeling neither side can see where my own reaction is coming from. Not only that, not many people seem to think too deeply about this group of SEALs. If they're like any other military office I've seem, they probably come from wildly different backgrounds and have opinions that cross the political spectrum. And they maintain that vital emotional distance in the face of the most intense circumstances I can imagine. They are almost certainly not perfect human beings, but rather a mixture of admirable and objectionable character traits. I have no way of knowing whether they did everything right or anything right at all. The conversation in the office mostly revolved around them, and what might have happened that led to a death rather than a capture. It was mostly theoretical, reserved, and distanced despite the intensity of emotion below the surface. And it was done during moments of downtime, because just like on Sept. 11th and every day since we had work to do. 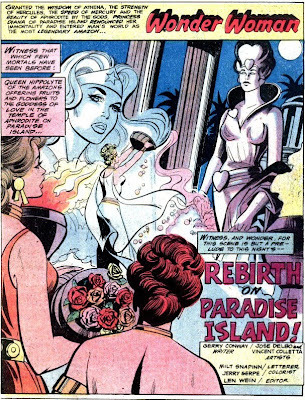 I know, Rebirth is more Yuletide but I liked the image of Hippolyta offering flowers to Aphrodite in front of the torch.